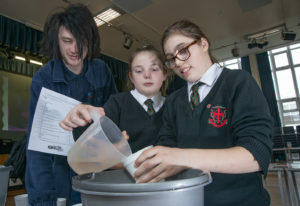 Holy Cross held their Mission Week with help from Animate as they explored their faith through lessons. Animate is a Catholic youth ministry team for the Archdiocese of Liverpool and they have been coming into school all year in the build up to Mission Week. Father Simon, a director at Animate, was a student at Holy Cross, leaving in 1995, and he has enjoyed coming back to the school. “I don’t get the chance to come back to Chorley a lot so I have enjoyed coming back to drive along the streets I used to walk and looking at where I used to sit in assemblies! “We have been preparing for Mission Week for 12 months, working with different teachers and giving different lesson ideas in drama, art, science and all subjects. “This week is a culmination of all the hard work and a lot of it is stage based. The theme is ‘Who do you say I am?’ and it’s a chance for students to think for themselves who God is and about their faith. In art, students made masks to commemorate the Mexican Day of the Dead Festival and also doves, where they put a personal prayer on the back. In maths, they measured the size of a cross and the height of Jesus as well as making cup cakes of circle theorems. In science, students made proteins and carried out flame tests with every department involved in making it a special week. Members of the community came into Holy Cross on the final day to talk to students and see what they had learnt and produced during Mission Week.